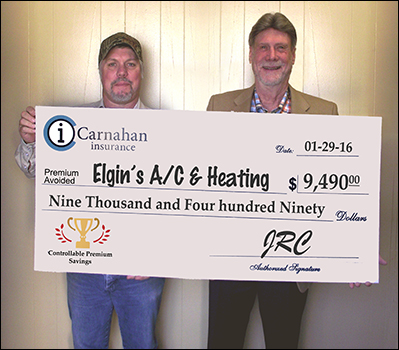 Carnahan Insurance announces that its first Controllable Premium award winner of 2016 is Elgin’s A/C & Heating, a company based in Cibolo, TX. Elgin’s was chosen as a great example of the amount of premium that businesses can save when they embark on a process to properly manage their insurance risk and, if applicable, workers’ comp program. Carnahan Insurance has a 4-page PDF entitled How to Lower Insurance Premiums that can be ordered free of charge by calling Jerry Carnahan. Jerry Carnahan is the owner of Carnahan Insurance agency and co-author of the Texas edition of Stop Being Frustrated & Overcharged, a book about reducing Workers’ Compensation costs. Jerry is also the brains behind SmartGuard(R), a proprietary process to identify and prioritize businesses’ unique risks. SmartGuard(R) was granted a registered trademark by the U.S. Patent and Trademark office! Jerry is available to speak to business, networking, benevolent and association groups on the topic: What Every Business Needs to Know About Lowering Insurance Premiums: 2016. Carnahan Insurance is a proud member of the Insurance One Agency family.